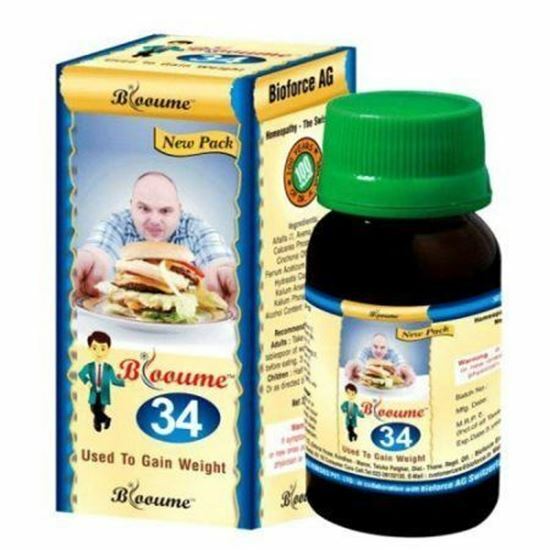 Blooume 34 is the remedy to gain weight. Helps in increasing appetite, improves digestion, used to calm hyperactive children. Contains: Alfaalfa , Avena Sativa, Calcarea Phosphorica 6x, Cinchona Officinalis, Ferrum Aceticum 6x, Ginseng, Hydrastic Canadensis, Kali Arsenicosum 4x, Kali Phosphoricum 3x. Adults: Take 20 drops in a tablespoon of water, 1/2 an hour before eating, 3 to 5 times daily. Children: Half the adult dose. Or as directed by the physician.